INDIANAPOLIS — A church burglary has neighbors talking about security in the community. People are concerned that on the intersection of East 34th and Hovey street, there is not enough light. Some neighbors even say they are afraid to go outside once it gets dark. "You would think twice about walking down this street at about 8 o'clock," said Michael Middleton. 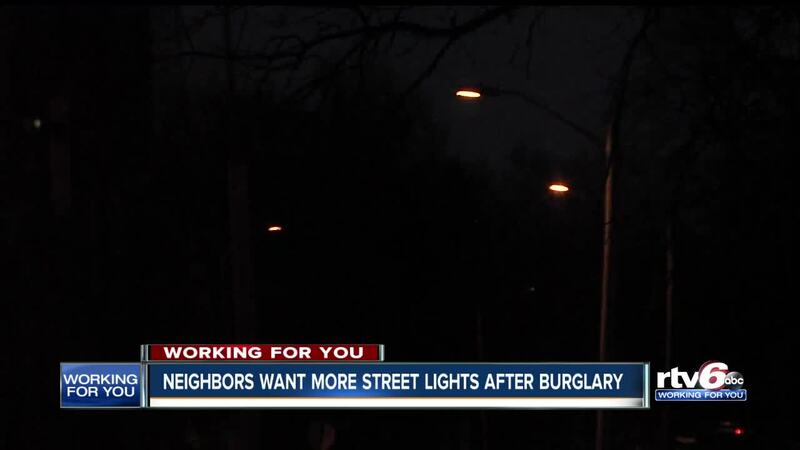 "There's been a lot of burglaries and break-ins up and down this street." There have been 34 reported incidents of Burglary, car break-ins and theft, within a mile of the Middleton's mothers house. Middleton's mother has lived on Hovey street for 34 years. Pastor Albert Baker installed additional lights outside of church, but wants the city to put in more. "Lighting is a big thing when it comes to security because it can be a deterrent," said Pastor Baker. Mayor Joe Hogsett launched 'Operation Night Light,' which will replace many current street light fixtures with LED lights. The savings will be used to install up to 4000 new street lights around the city. "I really believe it will be a blessing to not only this block, but the whole community — the whole area," said Pastor Baker. The city wants community members to make suggestions about where to install new lighting. A spokeswoman for the Mayor's office says IPL is running a feasibility study for the are, but it is not done yet. If you would like to request a new streetlight, go to my.indy.gov . If you would like to check out 'Operation Night Light,' click here .